Meeting with Fly Caucasus team in our office or on landing point near Ananuri. We pickup 1 to 4 persons per time to our 4x4 vehicle and go to takeoff with jeep tour on mountain road with stones and dirt to the snow fields. Prepairing to paragliding. Check weather conditions, gliders, lines, dress harness, helmets and cameras. Takeoff training and other safety prepairings of Fly Caucasus team. Takeoff and fly! You'll fly from 2900 meters above sea level to big cliff's, sheeps, waterfalls. 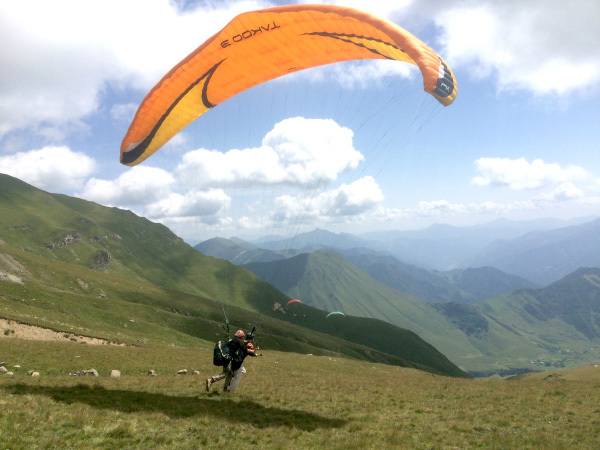 Climbing altitude in thermal lifts and soft landing after on big green field in Caucasus or near Ananuri. Gliders packing, photos with Fly Caucasus team and driving back to meet point. Payment, guiding, etc.